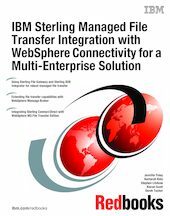 This IBM® Redbooks® publication describes how IBM has enhanced its managed file transfer portfolio consisting of MQ File Transfer Edition with the Sterling Business Integration Suite. The Sterling Business Integration Suite consists of Sterling File Gateway and Sterling Connect:Direct. Sterling Commerce, an IBM company, transforms and optimizes your business collaboration network by improving business agility, efficiency, and performance. These managed file transfer components from Sterling Commerce, an IBM company, partnered with MQ File Transfer Edition deliver proven value by protecting privacy and integrity of data in transit with governance, eliminate operations cell center traffic regarding file transfer exceptions, show a faster time to revenue, and bring a six-sigma level performance to key business processes. The integration and combination of these products allows for organizations to switch between protocols internally, allowing for diversity across business needs while still positioning the organization to easily move files outside their secured intra-enterprise network through an edge server to the external trading partner regardless of what protocol the external trading partner is using. This book is intended for organizations that find themselves wanting to trade data in a secure, reliable, and auditable way across both intra-enterprise and multi-enterprise protocols.